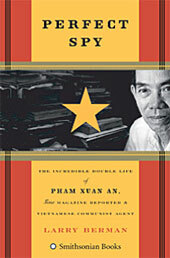 A review of Perfect Spy: The Incredible Double Life of Pham Xuan An, Time Magazine Reporter and Vietnamese Communist Agent by Larry Berman, ($26 Smithsonian Books, 2007). In November, 1974, in preparation for my departure for Saigon as correspondent for The New York Times, I traveled to Washington for some interviews, including one at the Central Intelligence Agency. I remember that conversation as though it were yesterday–in a small windowless room, with a 40-something gentleman whose name was never divulged. I remember it because it all came true. At that time, the war in Vietnam was over–as far as America was concerned. South and North Vietnam had been created at peace talks in Paris, much like North and South Korea–nations that it seemed possible might exist for decades if not centuries, side by side, eying each other suspiciously but with neither anxious to blink first. That was not the Vietnam my CIA interlocutor envisioned however. “I cannot tell you for sure when it will come apart, but it will,” he began. “Here’s what you must look for. First, there will be a small skirmish somewhere in the Central Highlands between the ARVN (our guys) and the Viet Cong. It will not be considered a very big deal. It will probably happen in a place like Phuoc Long or Ban Me Thuot, someplace in the Central Highlands. That will fall easily, then the whole province. Then Vietnam main force units will move down Highway One. They will meet little or no resistance. In days they will be at the gates of Saigon. It will all be over very quickly.” He leaned back, smugly, knowing he had shocked me. Frankly, I told him, I don’t believe it. Every expert I’d consulted believed it would be a slow, gradual erosion. The outcome was never in doubt. But certainly not in the two or three years I’d be based in Saigon. The CIA officer shrugged. Still, by Jan. 7, all of Phuoc Long Province was in communist hands. And just as my anonymous analyst had predicted, North Vietnamese main force units were on the move. Next stop: Ban Me Thuot. On March 10, the attack on this village in the heart of the Central Highlands began. (The North Vietnamese were moving a tad more cautiously than my analyst predicted, holding their breath for a massive American response from B52 bombers, which never came.) Ban Me Thout crumbled in two days. Next stop Pleiku. By April 9, North Vietnamese troops were pouring onto Highway One, headed for Saigon. The fourth largest standing army in the world (the ARVN, armed by the United States) was crumbling by the hour. In Saigon, everyone began heading for the exits. On April 29, 1975, those Americans still remaining in Saigon awoke to the strains of Bing Crosby singing Irving Berlin’s “A White Christmas” on Armed Forces Radio. It was the signal from the American Embassy. Last chance. To the choppers. The communists were at the gates. Inside those gates sat one man who, more than any other, had made this moment possible, as Larry Berman recounts in his riveting book, Perfect Spy. For nearly 20 years An was North Vietnam’s master spy–and at the same time ace correspondent for, successively Reuters and Time magazine, functioning as well as a funnel of information for everyone from The New Yorker‘s Robert Shaplen to David Halberstam and Neil Sheehan to reporters from every American television network and correspondents from Australia to France. Along the way, he saved the lives of some, kept others from making catastrophic errors of fact and judgment–all the time, passing critical strategic and tactical information to those in the communist military hierarchy to whom he owed his true and ultimate allegiance. The outlines of Phan Xuan An’s story are well known. He was “unmasked” within a few years of the North Vietnamese victory, lionized in the Vietnamese (communist) press, awarded a host of decorations and publicly promoted to the rank of General in the Vietnamese army. But here, for the first time, in his own voice and that of his family and closest friends, is the real life and times of An … or is it? Dispatched by his North Vietnamese handlers in his 20s to study journalism in California, An’s lifelong mission was to study America and the Americans, learn what motivated them, learn of their actions and, by a deep understanding of their motives, anticipate their next move and the move after that. All this enabled the Viet Cong and the North Vietnamese military to stay many steps ahead of anything the Americans could do to their country and whatever military might they could throw at them. Yet at times it seemed, as Professor Berman astutely points out, that An was working at counter-purposes to his communist masters. During the fall of Saigon, he helped important members of the South Vietnamese government to escape and routinely failed or refused to pass disinformation to important American and other foreign journalists–disinformation that might have substantially influenced public opinion or indeed the course of the war itself. The questions that remain unanswered cut to the heart of the decades of war, first against the French then against the Americans, and the nature of the society it produced. Might An ultimately have served multiple masters–his own nation, first and foremost, but also the CIA (where he maintained many friends) or the American embassy? Certainly he served well and effectively Time magazine–the beneficiary of innumerable “scoops” from An who most considered by far the best informed journalist in Saigon for decades. But he was also a close enough friend of CIA head William Colby that this master spy asked to see An on both of his visits to Vietnam after the communist takeover. In the end, Perfect Spy is far more than the much-told story of Pham Xuan An. It is the story of the enormous catastrophe that was Vietnam, the decades of errors in judgment and policy by a host of successive administrations on all sides, and ultimately the personal story of a compelling individual–a study of loyalty and friendship. While Professor Berman writes that An’s real loyalty was to his people and his country, perhaps as he also suggests, he owed his ultimately loyalty only to himself. David A. Andelman, executive editor of Forbes.com, is the author of A Shattered Peace: Versailles 1919 and the Price We Pay Today. Paintings sold for less than $50 ten years ago now sell for more than $50,000. Nguyen Qui Duc, art curator and author, suggests why. It wouldn’t be an exaggeration to say that art is big business in Vietnam. But a lot of money is changing hands in exchange for modern canvases, woodblock prints, or paintings on silk and the Vietnamese bark paper, giay. Gallery owners talk of selling individual works for tens of thousands of dollars, and some are financing frequent trips to the United States, Europe, and Asian cities such as Hong Kong, Singapore, and Tokyo. Meanwhile, artists in Hanoi, Ho Chi Minh City, and Hoi An are boasting about the houses they’re able to build for themselves as a result of their commercial success. The explosion of the art market in Vietnam started a mere few years ago. The increasing number of tourists since the early 1990’s has a lot to do with the interest in Vietnamese art, particularly among visitors from japan, Hong Kong, Taiwan, and other Asian countries. But awareness of Vietnamese art can be traced back to a handful of individuals who, for commercial and cultural reasons, have played major roles in putting Vietnamese art on the international map. Among these individuals are scholars, journalists, critics and writers, such as Jeffrey Hantover of Asian Art News, the scholar Nora Taylor and journalist Zina Matlock. Their articles have had significant influences on the careers of Vietnamese artists and their sales figures. The owners of Gallerie la Vong in Hong Kong, devoted entirely to Vietnamese art, have published glossy coffee-table books that are considered by some to be the bibles on Vietnamese modern art. Others disagree, but nonetheless it’s thought that they have driven up the prices of Vietnamese art significantly. The Smithsonian Institution and new Asia Review have devoted entire issues of their magazines to the arts in Vietnam. David Thomas, head of the Boston-based Indochina Arts Project, having had experience with putting together an exhibition of artwork by Vietnamese veterans, created a new show which was picked up by the Smithsonian. It’s been touring the U.S. under the title An Ocean Apart, a survey of Vietnamese art from the 1940s to today, including a small amount of work produced by Vietnamese now living in America. The Indochina Arts Project has also been bringing artists from Hanoi to the U.S. for visits and residencies lasting several months. In Vietnam, the critic/painter Nguyen Qhan and the poet Duog Tueng, both charming and both sporting the image of the archetypical Vietnamese intellectuals, have also been wielding much influence and gaining publicity through their contacts with Western media and cultural figures. Foreign owners and directors of galleries in Vietnam, such as Red River and Natasha in Hanoi, have been successful in creating attention for the artists they represent. All the excitement – and hype – even prompted the New York Times to publish several stories about Vietnamese artists and their art; last year the paper ran a report about the heightened interest and rocketing prices. But there is in fact good reason to be excited about contemporary art from Vietnam. The French brought modern painting to Vietnam with the founding of the Fine Arts College of Indochina in Hanoi in 1925. until then the Vietnamese had focused primarily on village arts, which included woodblock printing, temple carvings and sculptures, and some brush painting learned from the Chinese. For 20 years the French teachers trained Vietnamese students in fundamental classicism, sometimes encouraging them to apply Western Techniques on traditional, native themes; the students, in turn, taught further generations in the art of painting. During the years Vietnam was at war with America, artist of the northern half of the country required to work within the limits of socialist realism and propaganda art. Until just a few years ago, nudes and abstract or freer figurative works. Today, artists work in all styles. Oil paintings on larger canvases are becoming more common, but many artists still produce exquisite pieces, using gouache on paper. Among the artists currently doing exciting and popular works, a great many are Hanoi artists such as Dang Xuan Hoa, Hong Viet Dung, Tran Luong, Ha Tri Hieu, and Le Thiet Cuong. These are men in their late twenties and thirties, painting mostly oil-on-canvas abstracts and works depicting elements of Vietnamese traditional society with great styles and confidence. Few women are well-known, except for Dinh Y Nhi, a young graduate from Hanoi’s School of Fine Arts, fetching $500 to $1000 for black-and-white gouaches of whimsical yet harrowing stick figures. her prices may go up even further following recent exhibitions in France and Japan, and a stay at a prestigious California artist residency. Thanh Chuong, a former Hanoi graphic artist, paints vibrant self-portraits and village scenes both in gouaches and in oil. Most of his works starts at about $400. he recently produced hundreds of lithographs commissioned by a Korean representative of a large hotel chain. Le Quang Ha is another artist using vibrant colors to paint charming portraits, often with phallic lotus bouquets. Truong Tan, an openly gay man, has gained a measure of notoriety in recent years by painting men bound in tight ropes, and by adorning his works with English and French sentences confronting viewers with questions about AIDS and HIV. In the south, works by Tran Trung Tin, Nguyen Trung and Buu Chi (a Hue art professor), are among the most interesting. Do Quang Em’s hyper-realist approach has supposedly earned him $20,000 to $60,000 per painting, usually oil portraits of his wife or sill-life with minimal elements in extremely somber light. Nguyen Quan’s oils of altars and disembodied womens’ heads appeal to Dada lovers, who pay up to $5,000 for a painting. With so many artists and so many galleries, lovers of Vietnamese art often find it daunting to acquire the works. Tourists seeking a reminder of their Vietnam trip simply buy gouache renderings of Vietnamese country life, many under $100 or even less expensive, in small towns. The more serious collectors seek works by the masters such as Duong Bich Lien, Nguyen Tu Nghiem, Nguyen Sang, Hoang Tieh Chu and Bui Xuan Phai. These are among the first graduates of the College of Fine Arts, and their works are rare to find, with perhaps the exception of Nguyen Tu Nghiem’s. Bui Xuan Phai is undoubtedly the most well-known with his charming Hanoi street scenes. But the artist, who died in poverty in 1988, is also the most copied, since collectors will pay amounts almost impossible to imagine for paintings that ten years ago were being sold for less than $50. Gallery owners in Vietnam do a great deal to launch and promote their artists, and they’re known to weave the most interesting, sometimes-true stories around them. But stubborn art lovers will look past the hype, negotiate hard, and sometimes get very good prices by going directly to the artists. other art lovers still consider the great works available in Vietnam underpriced next to prices in the west, and will probably continue to help boost the art market in Vietnam. It’s been almost two years since Hurricane Katrina struck the Gulf Coast. While the major focus has been on the failure of the government to provide support to the majority African American community in the 9th Ward, the resilience of the Vietnamese American population in New Orleans East – a suburban community 15 miles northeast of downtown New Orleans – has been getting a great deal of attention. Both academic research and mainstream media seem to point to the idea of a hard-working community whose been through much worse than Katrina’s destruction. Dateline NBC’s Stone Phillips picked up as camera himself – with the shaky shots it’s very much Corporate Media meets Youtube – and spent Tet with this community earlier this year. His Postcard from New Orleans was produced by Vietnamese American Tommy Nguyen, who gives us a little insider knowledge here about the experience. On October 9th, 2005, just five weeks after the storm, Father Vien Nguyen of MQVN held Mass for 300 parishoners, most of whom were residents of the MQVN neighborhood. Given the ghost-town feel of most New Orleans neighborhoods at this stage, this was an outstanding turnout. The following Sunday, 500 residents had returned for services. On October 23rd more than 2,000 members of the Vietnamese community attended Mass at MQVN. By April of 2006, 1,200 or the 4,000 residents who lived within a one-mile radius of the church has returned. By the summer of 2007, approximately 90 percent of the residents were back and 70 of the 75 Vietnamese-owned businesses in the neighborhood were up and running. I felt an underlying sense in both the Dateline piece and the paper that this success story was being compared to the African American communities in New Orleans and what they went through. I was left wondering how much cross-cultural work was being done over the past two years. There were a few examples in the Dateline piece of other minorities looking to th Vietnamese community as leaders, but not really of coalition-building. Any Katrina experts want to weigh in on this? VietNamNet Bridge – Vietnamese artists can now sell paintings for more than US$5,000 apiece making the local art market heat up compared to ten years ago when a painting sold for less than US$50, according to a gallery owner. A painting named ‘Champa Witch Doctor’ by artist Bui Quang Anh is displayed at Tu Do Gallery. Anh is considered as a rising star in the HCMC art world because of his unique abstract style and because he only uses his hands to paint instead of using brushes. Tran Thi Thu Ha, who owns the Tu Do Gallery, the first private gallery in HCMC, told the Daily that it would not be an exaggeration to say that art is big business in Vietnam. A lot of money is changing hands for modern canvases, woodblock prints, and paintings on silk and Vietnamese bark paper. She said the explosion in Vietnam’s art market started a few years ago. The increasing number of tourists since the early 1990’s has a lot to do with the interest in Vietnamese art, particularly among visitors from European countries and Asian countries like Japan, Hong Kong and Taiwan. Many years ago, tourists bought Vietnamese paintings as souvenirs. However, now they come to Vietnam to buy paintings for their collections and to trade because they have begun to recognize the value of Vietnamese art. “It is not only foreigners keen on Vietnam paintings, some local collectors and art enthusiasts have made a great contribution to the paintings market heat up,” Ha added. Art critic Phan Cam Thuong said that many years ago 10% of paintings were sold in the domestic market. However, about 30% of paintings are now purchased by local clients. Until just a few years ago, nudes, abstract or free figurative styles were not popular and works of nudes and abstract styles were banned from museums and exhibitions. Today, artists work in all styles. Oil paintings on larger canvases are becoming more common, however, such as Dang Xuan Hoa, Hong Viet Dung, Tran Luong, Ha Tri Hieu and Le Thiet Cuong still produce exquisite pieces in the old style. In the north, Thanh Chuong and Pham Luc’s works are the best selling paintings on the market. While in the south, Do Quang Em’s hyper realist approach has supposedly earned him US$20,000 to US$60,000 per painting. His works are usually oil portraits of his wife or life that are done with minimal elements in extremely somber light. “Now, Em’s paintings are hunted by many art collectors,” Ha said. Sotheby’s and Christie’s auction houses have also recognized the value of Vietnamese art works and regularly sell paintings from contemporary and master Vietnamese artists. Although the local paintings market has warmed up, industry insiders still express concerns when galleries are opened that sell unauthorized paintings. Art critics say that copied paintings hurt the growing market in Vietnam because it makes collectors lose faith as well as affects market expansion. Aside from the situation of the booming copied paintings market, traders and artists have not paid much attention to the marketing of art. Artist Hoang Duc Toan, a member of the Vietnamese Fine Arts and Photography Association complained that traders and artists usually spent a small sum of money for exhibition advertisement because funds for marketing are limited. Ha confided that her gallery has not spent much on exhibition activities as well as the paintings trade because marketing expenditure is small. “At present, exhibition advertisement is mainly dependent on the free support of the local media,” she confided. Thursday started my first full day of shows here in New York and I was really looking forward to seeing the collection of newcomer Thuy Diep, a young designer who grew up in Canoga Park in the San Fernando Valley. The California-reared Vietnamese-American, who’s worked for such powerhouses like Carolina Herrera, Zac Posen and Bay Area native Peter Som, showed 17 looks in an airy, loft space this afternoon. Her second collection since she started her label, Thuy. Her design aesthetic fit the space – uncluttered, modern, bright. That would include a simple shift, done in silver glittery fabric, with three horizontal tiers draped so that part of the lines appear as if they are melting. Diep, who was born in Phan Thiet, which she describes as a resort town located between Ho Chi Minh City and Hanoi. Her parents were tailors who ran a tailoring school and custom clothing business before immigrating to the U.S.
Diep was educated at Brown University and worked for Pricewaterhouse as a consultant before going to Parsons School of Design (yes, the one featured in Project Runway) and taking on draping and pattern making jobs for Herrera, Posen and Som. Last season, she struck out on her own and impressed a number of luxury retailers, including Bergdorf Goodman. She giddily says she’s booking “quite a few” appointments with buyers interested in this spring line. Especially in the spotlight: the slim tuxedo jackets. Her coats – a silver gray linen blend one and a floral brocade, kimono sleeve one – struck me as pretty special. They will retail for about $1,000. Also special, a blue satin high waisted pencil skirt with seams and a diagonal cut that hugged curves in the right places, eliminating the sort of ride-up inherent in the shape of a pencil skirt. Genius. Diep is definitely one I’ll watch. She’s talented yes, and that’s reason enough. But her heritage alone should spark the interest of many in Silicon Valley’s Southeast Asian community. VietNamNet Bridge – A website for the Vietnamese Embassy in Argentina was launched on Sep. 4 on the 62nd anniversary of Vietnam’s National Day. The website is in Spanish and Vietnamese and at the address http://www.vietnamembassy.org.ar. According to Vietnamese Ambassador to Argentina Thai Van Lung, the website has been built to meet the demand for updated information’s from Argentinean people as well as other South American countries. Also, the website includes information in Vietnamese to serve overseas Vietnamese living in South American countries, and help them understand clearly about guidelines and policies of the Party and State to the overseas Vietnamese. The ambassador said that he believes that the website will be useful to South American countries, especially Argentina. Through the website, they will understand more about Vietnam’s culture and social-economic development, and its achievements during the renewal process and continue to contribute to expanding and further consolidating this bilateral relationship.